Indonesia has a long and rich tradition of homosexual and transgender cultures, and the past 40 years in particular has seen an increased visibility of sexual minorities in the country, which has been reflected through film and popular culture. 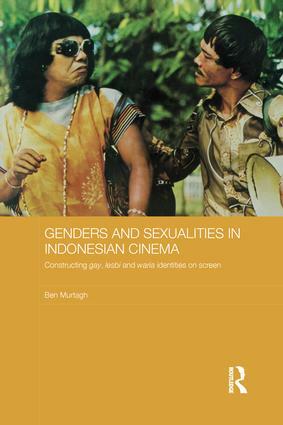 This book examines how representations of gay, lesbian and transgender individuals and communities have developed in Indonesian cinema during this period. The book first explores Indonesian engagement with waria (male-to-female transgender) identities and the emerging representation of gay and lesbi Indonesians during Suharto’s New Order regime (1966-98), before going on to the reimagining of these positions following the fall of the New Order, a period which saw the rebirth of the film industry with a new generation of directors, producers and actors. Using original interview research and focus groups with gay, lesbi and waria identified Indonesians, alongside the films themselves and a wealth of archival sources, the book contrasts the ways in which transgendered lives are actually lived with their representations on screen. "In revealing the richness and contestability of gender and sexuality in Indonesia Murtagh’s book is a triumph." "…I strongly urge you, dear reader, to enjoy this text yourself. We are now in an era where the study of internet technologies, particularly social media (like Facebook) and smartphones, has moved to centre stage. This is appropriate (and reflected in my own research) but it behooves us to remember that the earlier technologies of film and television remain incredibly relevant. They shaped the historical context of current digital cultures in Indonesia and beyond, and have moved into those cultures as key content to be viewed, circulated and commented upon. It is precisely in such times of transformation that historical context is so important. GSIC will take a well-deserved place as a canonical analysis of gay, lesbi and waria-related cinema in modern Indonesia. We cannot understand contemporary Indonesia without the insights Murtagh provides." Ben Murtagh is Senior Lecturer in Indonesian and Malay at SOAS, University of London and managing editor of the journal Indonesia and the Malay World.